One day, high school student Sakaki Yuuichi awakened his power to see words over other people heads. It is the ability to see the power of enemy's soul called "Lord of Soul" (named by his sister). Suddenly suspicious people with words like "Undead," "Witch," "Vampire" started to appear everywhere around him! Furthermore, the "Serial Killer" Natsuki started to approach the confused Yuuichi....!? A fighting comedy story about the "strongest" brother who endured the "training" of his "chuunibyou" older sister begins! 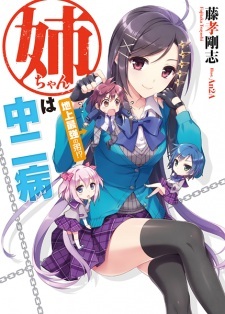 Neechan wa Chuunibyou was published digitally in English as My Big Sister Lives in a Fantasy World by J-Novel Club from December 3, 2016 to December 30, 2017.